The Dave Ramsey Show is your daily dose of real talk about life and money. 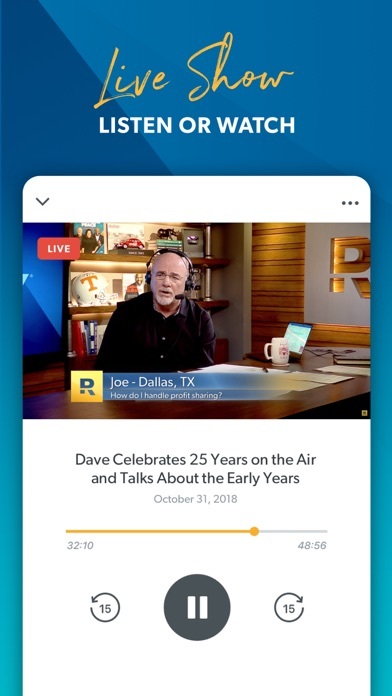 Now you can get the show when and where you want it. Dave Ramsey is America’s trusted money expert. Get practical answers for life’s tough money questions. Join millions as they learn how to escape debt and build wealth. Listen and Watch Live Join over 15 million people from coast to coast and find the hope and inspiration you need to take control of your life and money. Download and Play Past Episodes Find all the past episodes right here—anytime, anywhere. Keep track of where you left off and download episodes to play them offline! 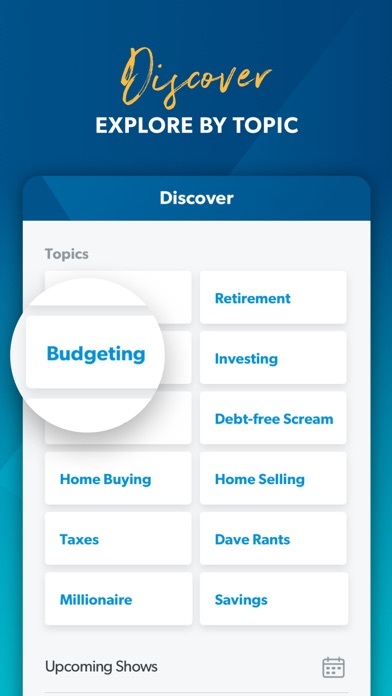 Discover Don’t miss your favorite moments, like Dave rants, debt-free screams, Millionaire Theme Hours and more. 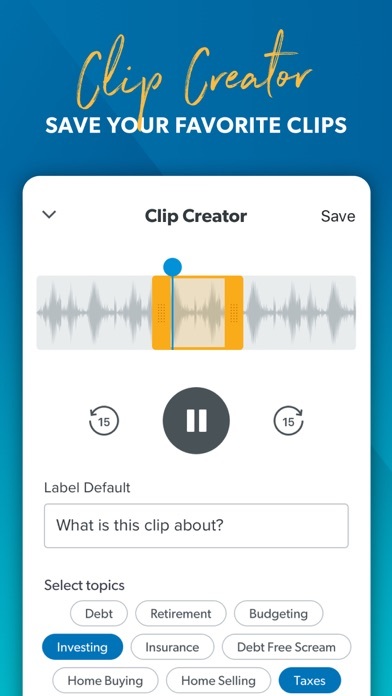 Save Your Favorite Clips With Clip Creator, you can capture your favorite sound bites and save them to your library. My Library Clips that you create from your favorite episodes or save from the Discover tab will show here. 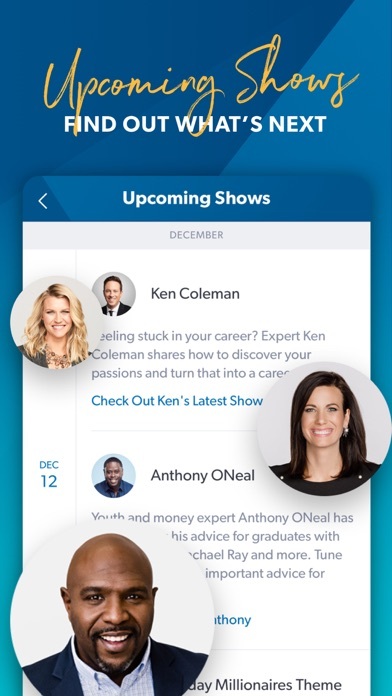 See What's Coming Up Dave often hosts special guests, like leadership experts, best-selling authors and celebrities. Plan ahead so you don’t miss any of the action. Best app ever. Dave is the man!! ”Sensible people will see trouble coming and avoid it, but an unthinking person will walk right into it and regret it later.” Proverbs 22-3 Thank you Ramsey team for helping me become more SENSIBLE!! I love Dave Ramsay. I’ve been listening for 4 years. The app just changed. Now, instead of it being audio, it’s forced video. This means I can’t lock my phone and listen. I can’t multitask on my phone and listen. The second I leave the app it stops. I used to be able to listen while checking email, etc but now I can’t. I can’t jog and listen because I can’t lock my phone or it stops. I also can’t fast forward or rewind by 10 or 30 seconds like I easily could before. I really hate this change. Change it back please!!! If I want video I’ll go to YouTube. It keeps me motivated to give & live my best life. Thanks to Dave’s teaching, I’m proud to say we’re everyday millionaires. We’ve truly changed our family tree! Wish I know about Ramsey years ago. Just heard about him 6 months ago started the seven steps 2 months ago. Already paid off 22k of my 42k owed. On my way to debt freedom. My husband and I are in our 70’s and it is never too late to learn. 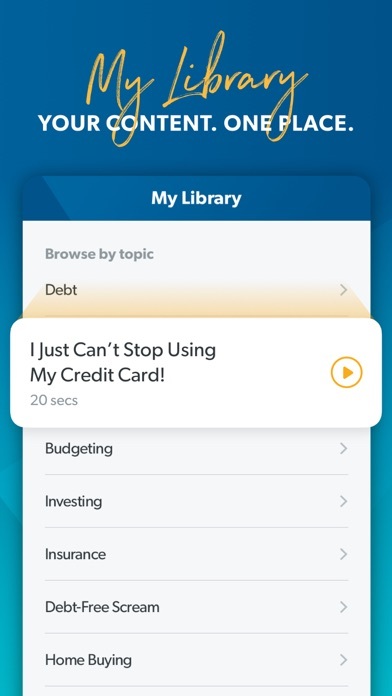 Dave Ramsey’s curriculum gave us the tools and the plan we needed to get control of our money and be debt free outside of our home for the first time in our marriage. 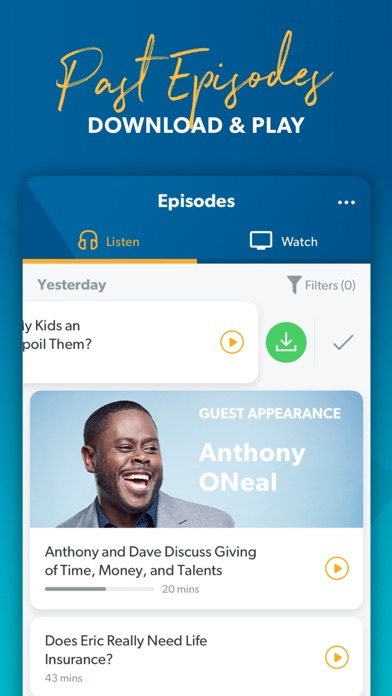 Favorite app for listening to the show.